He is 15years away from clocking a century old, but you wouldn't believe it when you see him. And it will shock you even further when you see him run. Meet Ed Whitlock—the 85 year old marathon runner as fit as a 20 year old, and be inspired this 2017. He is a phenomenon. Scientists are desperate to learn how an 85-year-old man continues to surpass expectations with his superhuman running. Whitlock ran a sub-four hour marathon in October breaking the world record for his age group by 40 minutes. 10 years ago he broke one world record. When he was 75 the London-born runner ran the marathon in under three hours in another record-breaking time which he still holds. Amazing scientific speculation. Experts think the secret behind his enduring physical strength is an 'astonishing genetic inheritance'. He is said to be aging far slower than a normal human should. Michael Joyner, a researcher at the Mayo Clinic, said Mr Whitlock's superior fitness came from an ageing process which was far slower than a normal 85-year-old's. Super young internal organs. Tests have shown his lungs are as fit as someone who is active in their twenties. And his organ's capacity to use oxygen is higher than any other person of his age on record. He will give far younger runners a run of their lives. Despite his age his muscles continue to power him round races at a pace usually seen in men 60 years his junior. The world's most successful octogenarian runner, who now lives in Canada, only took up competitive running seriously in his 40s. 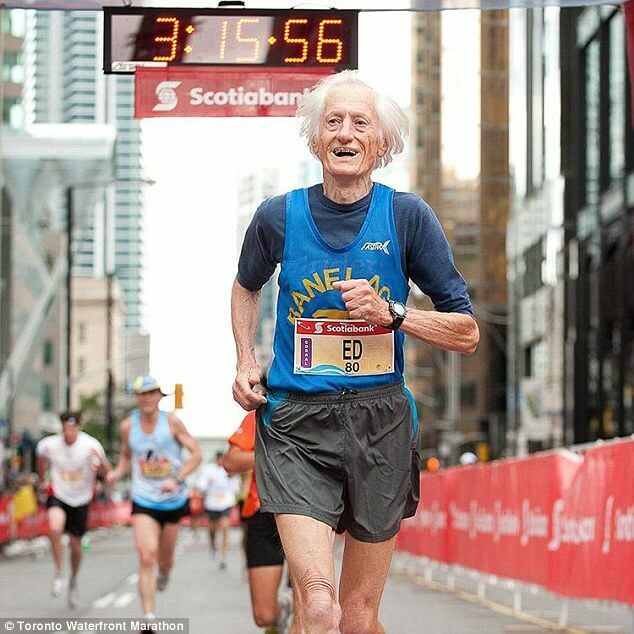 Despite his endurance Mr Whitlock, from Milton, Ontario, believes he may not be running when he is 90. He has always been keen on running. Mr Whitlock enjoyed running cross-country, track and road races in his youth. His sub-four hour marathon time of three hours, 56 minutes came in October in Toronto. We are inspired by this amazing man as the new year kicks off. There's no looking back now.